← Is Dickens too dramatic? The Albert Bridge at sunset. 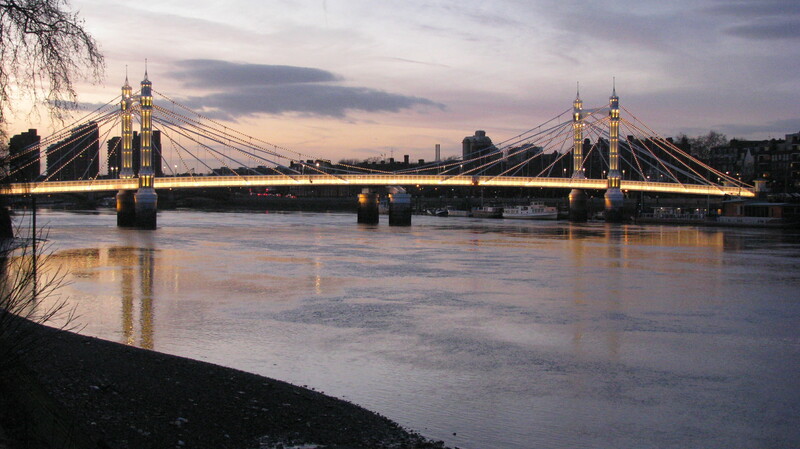 This bridge spans the River Thames in West London, connecting Chelsea to Battersea. This entry was posted in London, Travel, Travel Photos and tagged Albert Bridge, Battersea, Bridges, Chelsea, English History, London, London Bridges, Nature, Photography, Rivers, Sunset, Thames, Travel Blog, Travel Journal, Travel Photo, West London. Bookmark the permalink. I agree, bridges are beautiful and London has quite a few. I love the lights along the bridge. It makes it look like it’s made of gold. great one TBM and like the lights! I love bridges that are lit up a night. Beautiful. I was fortunate and saw this bridge just at the right time of day. I love the symbolism of bridges, this one is lovely! Beautiful night photo – I like how it is lit up with the glows in the water. I have a fondness for taking photos of reflections and light on water. Thanks. Very nice. I love that time of day. Sunrise and sunset are my favorite times of day. How often are you correct when you are guessing? Lovely picture and the light setting is just perfect! I really lucked out on the timing! Gorgeous. I’m happy to see some of your London shots. Are you settled in? I was drawn to them. Lovely. Albert Bridge is such a pretty one. The bridge is very beautiful, especially with the lights. Love how the Thames and the sky match so good together, in the same colour palette. It draws extra attention to the bridge. Well shot! Thanks! I couldn’t stop staring at colors when I was there. I’m glad they appear in the photo. The evening light and the lights on the bridge really make this a great photo. Thanks! I was lucky with my timing. I loved this bridge and couldn’t stop taking photos of it. Thanks for the nomination and congrats to you!